Running back Napoleon Maxwell led the ground attack rushing for 54 yards on six carries. 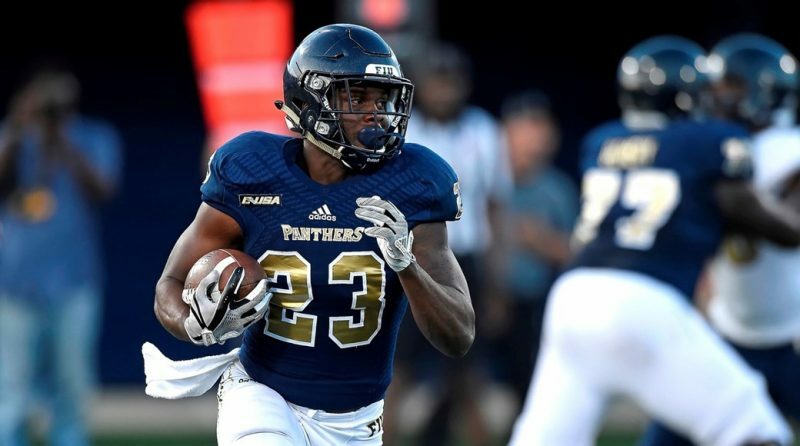 For the first time since 2017, FIU fans saw their football team take the turf at Riccardo Silva Stadium in the annual spring game. The Friday night scrimmage saw defense and offense compete for points based on field position, turnovers, overall plays and touchdowns and field goals, respectively. The offense won the night 14-13. “This game can be harder because you have to go in and blow up your roommate or your best friend or someone who’s in the locker room next to you,” said Head Coach Butch Davis. No one watched closer than the second-year coach, who paced with playbook in hand behind his offense. It was Davis’ first look at a game without his former leading passer Alex McGough, leading receiver Thomas Owens and leading rusher Alex Gardner. “We’ve been pushing the envelope over the last two months and asking our players ‘Who is going to step up? Who is going to be the next leader in your position group?’” said Davis. The Panthers are coming off of a regular season of eight wins and a Bad Boy Mowers’ Gasparilla Bowl appearance. Excitement surrounds the team, but questions remain. Following McGough’s graduation from the team, an opportunity presents itself for a quarterback to secure the starting role. Junior Maurice Alexander, junior Christian Alexander and freshman Kaylan Wiggins all had a chance to audition. “One of the main things we wanted to see tonight was to give the quarterbacks an opportunity to show up and make good decisions and protect the ball. There were some really bright spots from that standpoint,” said Davis. The Panthers’ offense had one turnover all night — a fumble. Juniors Christian Alexander and Maurice Alexander had equal opportunities against FIU’s defense. Freshman Kaylan Wiggins took a few drives under center as well. With Gardner graduating from the team, the starting running back position is wide open. Senior Napoleon Maxwell, senior Anthony Jones, sophomore D’Vonte Price and junior Shawndarrius Phillips lead a backfield with a versatile set of skills. These backs, whom Davis has called the “strength of this team,” all received carries on Friday night. “We’re all going to show a different skill. We call the running back in the ‘Show Time’ back because no matter who is in, something different is going to happen,” said Phillips. Davis is no stranger to versatile backfields loaded with talent. At the University of Miami, he coached Clinton Portis, Frank Gore, Najeh Davenport and Willis McGahee together. They each went on to play 10 years or more in the National Football League. Senior Anthony Johnson continued his dominance on the defensive line on Friday night. With senior Fermin Silva making the position change to linebacker, Johnson’s responsibilities have been amplified. Still, he believes his defense is ready for the challenge. “We have an equal amount of pass rushers on the roster and defensive ends coming in with this freshman class. I don’t think we lost much,” said Johnson. The senior defensive tackle will not be short on talent to mentor. Two four-star junior college transfers, Teair Tart-Spencer and Tayland Humphrey, will join the team in the summer. All in all, the team is excited to see what 2018 brings. “We’re going back to the bowl game, but this time we’re not going just to go. We’re going to win,” said Isaiah Hill, a junior safety. It is refreshing for Alumni to observe the ongoing improvements made by Coach Davis. FIU’s academic reputation has been stellar for years now, and still rising. The only Big Thing missing for our Alma Mater was a consistently competitive NCAA football team. I hope those fine young players know that – besides the students and faculty around them – there are almost a quarter million graduates cheering for their successes!